Photo by H. Zell (CC BY-SA 3.0). Calendula, otherwise known as Pot Marigolds, are an easy to grow, annual flower native to Egypt and Mediterranean areas. Calendula plants grow to about 60cm tall. They produce large quantities of bright orange daisy flowers 7cm in diameter over a long flowering period. Calendula flowers help to attract beneficial insects to the garden and have many medicinal uses. Calendula petals are edible, adding colour when added fresh to salads, and can also be dried and used as a substitute for saffron for colouring various dishes. Like all edible petals, Calendula is great for adding a touch of colour and interest to salads. Crushed Calendula flowers can also be used as a healing agent in infusions and tinctures applied to areas of skin inflammation, minor burns, cuts and abrasions. They can also be used to make skin lotions for dry and sensitive skin. 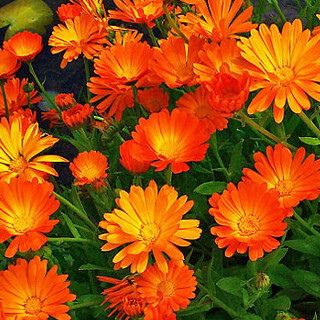 Avoid Calendula use when pregnant or lactating. Preheat over to 100 degrees Celsius, then once heated turn the oven off. Mix the petals and oil in a oven-proof container and place into the warmed oven for 4 hours to infuse. Strain out the petals from the oil, be careful as it'll still be very hot. Add the beeswax to the oil and return to the oven until it has almost melted, stir to finish mixing the beeswax into the oil. Pour the mix into a sterile container for storage and allow to fully cool for several hours. Calendula flowers best when grown in a location that receives full sun, though they can also be grown in partial shade. Prefers a fertile, free-draining soil. Will self-sow readily. Water regularly. Can be grown in pots or planted in the ground. In the subtropics sow Calendula seeds from May to September. In temperate areas sow from August to November. In the tropics sow from March to August. In cold regions sow from September to November. Sow Calendula seeds about 1cm deep spacing plants about 25cm apart. Calendula seeds take between 10 and 14 days to germinate. The first flowers are produced 7 to 8 weeks after sowing. Harvesting the flower heads regularly will encourage the plant to produce further heads.